March 2019 Minutes – The Cliftondale Community Club is a non-political, civic organization formed to enrich and encourage development of the Cliftondale community through non-profit service. The Cliftondale Community Club, Inc. met March 11, 2019 at the Cliftondale Community Center. Vice President Marcus Carter presided. About 15 members and guests were present. Distinguished guests included Channing Parham, Community Engagement Representative for Commissioner Marvin Arrington. Harold Reid, who represents the Club at the South Fulton Parkway Alliance, reported that its recent guest speaker spoke on MARTA’s transportation improvement plan. MARTA is concentrating on north Fulton County and on Highway 29 in south Fulton, since it already has bus routes on Highway 29. Regarding eventual plans for the South Fulton Parkway, MARTA envisions Bus Rapid Transit (BRT), involving dedicated bus lanes and bus stops. However, ridership will have to grow considerably before BRT would get underway. Secretary Gayle Lesser, speaking as Treasurer liaison, provided the Treasurer’s Report. Ms. Parham announced that Commissioner Arrington will sponsor Family Fun Day on May 4 in Welcome All Park. She emphasized that the Commissioner is trying to reach out to young people. Ms. Parham’s office is located in the South Fulton “Annex” on Stonewall Tell Road, and she invited residents to contact her there or by phone with any concerns. Mr. Reid asked Ms. Parham if the County had any plans for a Cliftondale senior center given the community’s senior population. She replied there were no current plans, noting that building a stand-alone center would take time. Tommie Stegall asked if there was any possibility of a private partner like the YMCA, and she replied that private partners would always be welcome. Storm Mitchell reported on the recent CZIM (Community Zoning Information Meeting). There were two zoning applications of interest. First, Habitat for Humanity is proposing a resale store of donated and unneeded construction materials in a former used car facility on Old National Highway. However, Old National’s Overlay prohibits discount centers. The second application concerns The Bluffs, a development proposed for land just this side of Camp Creek Parkway between Butner and Fairburn Roads – land that falls into both the Sandtown and Cliftondale Overlay Districts. Mr. Reid said there was an Agreement on zoning conditions between the developer and the Sandtown Association for the land in that District, but Cliftondale’s negotiations did not lead to a signing. Mr. Mitchell explained the developer originally planned on 3 lot sizes, but the terrain is so steep it will exclude the smallest lot size. For the remaining lots, the developer wants to decrease front setbacks (distance from the house front to the street) from 45 feet to 20-25 feet and side setbacks (distance from the side of the house to the lot line) from 20-foot building separation to 7.5 feet fixed setbacks. Mr. Reid suggested we might consider flexible setbacks if the total distance between houses was 20 feet. Mr. Mitchell distributed a list of questions to be used as a guide for public discussion in planning this year’s rewrite of the City’s Zoning Ordinance. The City is currently using the carried-over Fulton County Ordinance. 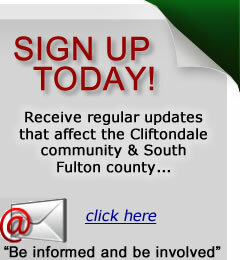 Public meetings will begin next month; the Cliftondale April meeting will focus on the issue. Several attendees urged that impact fees be added to the list. Impact fees – usually a few hundred dollars per house – are charged to developers to help the community cope with the new residents’ “impact” on public services such as local roads, parks, sewer, libraries, etc. Another consideration is items common to all City Overlays that could be part of the Code itself. In addition to the Zoning Ordinance, Mr. Mitchell noted that the City will be revising its Land Use Plan (LUP), which identifies specific areas to be designated as commercial, light and heavy industry, residential and residential density, etc. A critical issue here is to plan sewer routes – the sewer system is owned by the County — to accommodate future use that cannot be handled by the existing system and septic tanks. The area’s sewer trunk lines date back to the 1960s and 1970s and are nearing the end of their life cycle as they also face the demands of 100,000 and growing City residents, plus other south County municipalities. Mr. Carter thanked the speakers and audience for an informative and stimulating meeting. The meeting was adjourned. This entry was posted on March 31, 2019 at 2:46 pm. You can follow any responses to this entry through the RSS 2.0 feed. Both comments and pings are currently closed.